Can You Partially Cook a Chicken Then Finish Cooking It Later? Balancing a busy schedule with healthful, home-cooked meals is no easy feat. It usually requires a degree of organization and planning, and preparing foods ahead of time whenever possible. Some ingredients, such as fresh vegetables, can be partially cooked ahead of time. Others, such as chicken, can not. Chicken is an ideal host for many microorganisms that cause foodborne illness, and par-cooking it ahead of time raises that risk substantially. Foodborne illnesses are caused by a wide range of potentially harmful microorganisms, referred to by scientists as pathogens. Chicken often contains pathogens, including salmonella, E. coli, Staphylococcus aureus and Campylobacter jejuni. The likelihood of getting sick from these pathogens depends largely on how many there are in your piece of chicken. For each pathogen, there's an infective dose, a minimum quantity needed to cause illness. Each pathogen's infective dose is different, but more is always worse. That's why food safety literature emphasizes the importance of cooking times and temperatures. Humans flock to areas with a favorable climate, where it's neither too hot nor too cold to be comfortable. Pathogens appreciate favorable temperatures just as much. At temperatures below 40 degrees Fahrenheit, most pathogens are too sluggish to reproduce freely; at temperatures above 140 degrees, they struggle to survive. Between those two limits, pathogens in a favorable environment -- such as a chicken -- can reproduce with staggering speed, sometimes reaching populations of millions in as little as a couple of hours. This temperature range is usually referred to as the food safety "danger zone," for just that reason. When you par-cook your chicken ahead of time, you're essentially creating an incubator for foodborne pathogens. Although the outer areas of the bird cook fully and become temporarily food-safe, the inner regions only become warm enough to put them squarely into the danger zone. They'll eventually cool when you put the chicken back into the fridge, but in the interim any pathogens reproduce merrily for hours. Cooking reduces the number of viable pathogens but seldom kills them all, so a chicken with a large initial population of bacteria can make you sick even if it's thoroughly cooked. The risk is even higher if it's undercooked slightly. The only time it's safe to par-cook your chicken is when it will finish cooking immediately. For example, it's often difficult to completely cook raw chicken pieces on the grill or broiler without charring the surface. If you par-cook the chicken pieces in hot water, then immediately transfer them to the grill, the preheated chicken will quickly finish cooking to a foodsafe temperature of 165 F. Whole birds must be fully cooked to 165 F, from start to finish. 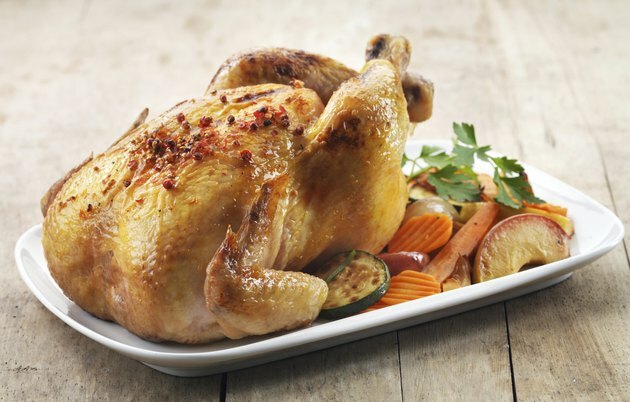 Once your bird is cooked, you can hold it safely at a temperature of higher than 140 F for an hour or two, or refrigerate it and later reheat it to 165 F.
Can You Cook Chicken That Was Thawed to Room Temp? What are the Dangers of Cooked Meat Left Out Overnight? Can I Thaw a Lobster Tail Under Running Water?